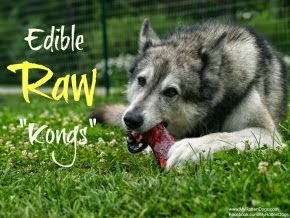 I am a fan of raw feeding, obviously. I support and encourage all forms. Full raw, partial raw, some raw goodies on occasion. Prey Model Raw, BARF, Premade Raw, Dehydrated Raw. I think they are all wonderful. 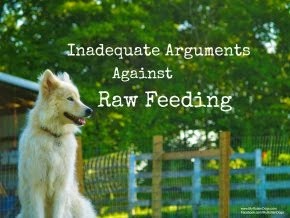 There are some who would like to supplement with raw or feed full on raw without having to worry about balancing the diet themselves, but want to feed their dogs actual "meat." This is where frozen premade raw comes in handy. Many smaller pet supply stores and boutiques now have freezers stuffed with various brands of premade frozen raw dog food. It can be quite expensive to ship frozen food, and then you have the fears of the food actually arriving frozen. 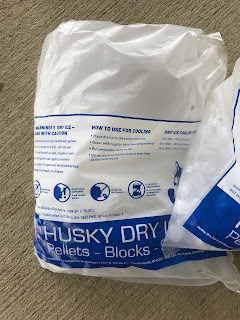 I was pleasantly surprised to learn that chewy.com ships frozen raw dog food, and shipping is ABSOLUTELY FREE on orders over $49! 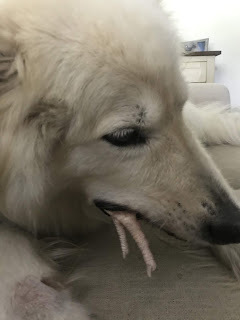 We recently received some Instinct Raw (Grass-fed Lamb) from chewy.com, and I have to admit I was a little hesitant about ordering raw dog food to be shipped in the middle of summer. Guess what? 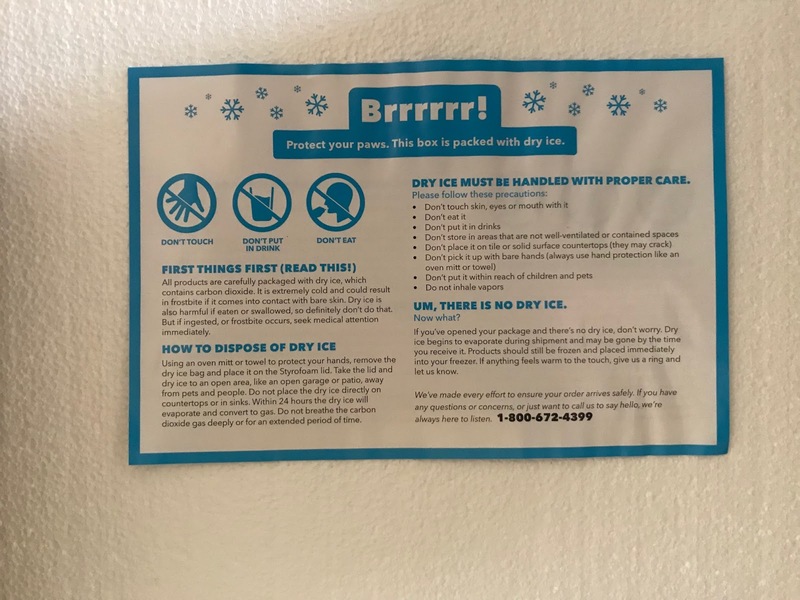 It arrived completely frozen. Chewy packed it in it's own box, with all 6 sides insulated with thick Styrofoam. 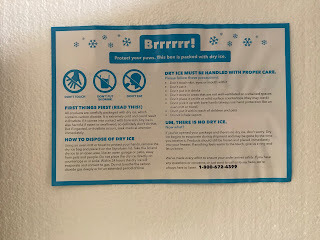 And they included dry ice. The dry ice was still pretty intact upon arrival. I simply removed it with oven gloves and allowed it to dissipate in my driveway. They are complete and balanced. No need to do the math and make sure one is feeding a balanced diet. They come in a variety of proteins. Raw feeders stress the importance of variety, and Instinct allows you to feed different sources of protein - chicken, beef, and lamb. Their size makes portioning easy. 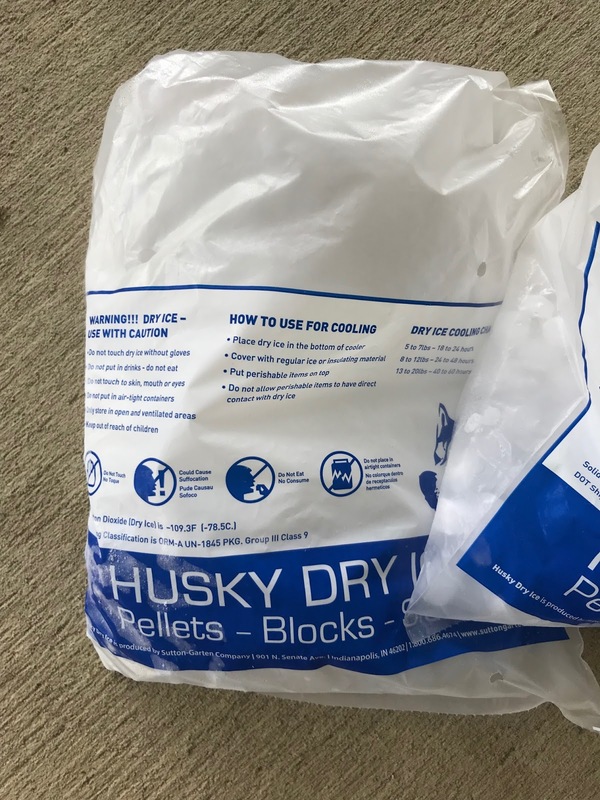 Weighing in at approximately 1 ounce each, it is easy to count out how many your particular dog needs, no matter whether they are large or small. Large dogs can eat them frozen or thawed. I feed them to my gang frozen. My dogs LOVE them! Check out this video of Neeko adorably dancing and singing because I have a bowl full of Instinct Lamb medallions waiting for her on the other side of the gate. Whether one feeds full, partial, or some raw, Instinct raw is an easily obtainable (Free shipping on orders over $49), balanced way to feed your dog raw. My Rotten Dogs are Chewy Influencers. We were provided with complimentary product. All opinions and images are my own. If Bruce were a human, the things he does would put him in prison. And Neeko and Faolan would likely be as well. Theft - I can't even begin to list the number of things that he has stolen. From me. From Neeko. From Faolan. Toys. Food. Items of clothing. Receiving Stolen Property - he and Faolan have collaborated to steal from me in the past. If sweet Faolan is successful, Bruce is more than happy to take the goods. Public Urination - on the regular. He can't walk anywhere without trying to pee on everything. Public Indecency - put your lipstick away, buddy. Loitering - he likes to hang out and do nothing. Noise Violations - sometimes he likes to howl at 3:30 in the morning. Inciting a Riot - I swear he encourages bad behavior from Neeko and Faolan. Assault and Battery - On me, though the times are explainable. He pleads the fifth regarding the incidents with poultry. Vandalism - he likes to attempt to destroy things that don't belong to him. Attempted Breaking and Entering - it's a good thing he doesn't have opposable thumbs. Otherwise he'd be in any room or structure he pleases. He does try to turn door knobs with his teeth. Obscenity - he's got a big mouth, and sure likes to scream sometimes. Voyeurism - he's a creeper. Resisting Arrest - if he's in trouble, he wants nothing to do with me. Speeding - watch out when he has the zoomies. 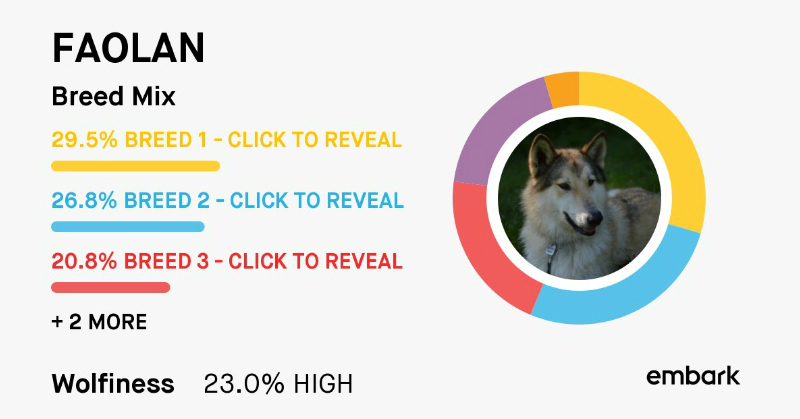 Would your dog be in prison if they were a human? Are they guilty of any of these crimes or others? Last week, Neeko had a follow up with our primary vet, the wonderful Dr. Cindy Baker-O'Dell. Some adjustments were made to her treatment regimen. 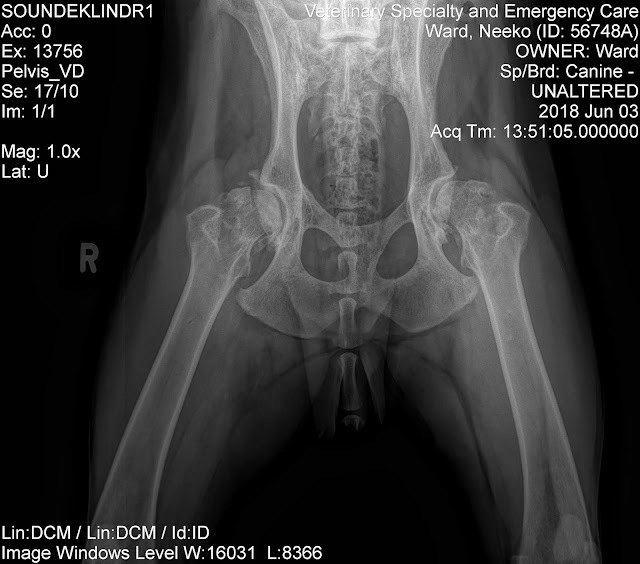 She had an x-ray of her paw, the bone lesion is unchanged. She had an ultrasound of her spleen, Dr. Baker-O'Dell said her spleen is "beautiful." She will have follow up chest x-rays in September. A couple of medication/supplement changes were made at her appointment last week. She is not really limping on her front legs now, so our primary concern is her hips. The emergency vet described them as "horrible." Dr. Baker said she almost wishes she had never seen Neeko's hip x-rays. Short story long, my girl has bad hips. But we are doing everything we can to treat them, short of surgery at this point. I am actually interested in surgery and/or stem cell therapy for her hips, but we have to be certain there is no underlying disease process at this point. The following is Neeko's current hip/joint regimen, which seems to be working pretty well. Dr. Baker stopped the carprofen, and her appetite almost instantly came back, which is a good thing. Adequan - polysulfated glycosaminoglycan. It is derived from bovine (cow) trachea, and is FDA approved to prevent cartilage loss and may restore joint lubrication, relieve inflammation, and renew the building blocks of healthy cartilage. Adequan is available by prescription only from your veterinarian. It is typically injected approximately once per month after a loading period in which injections are given twice weekly for four weeks. Following is a video demonstrating how easy it is to inject adequan into your dog. Fish oil - fish oil dosing can be confusing. There is the mg of actual fish oil, and the mg of DHA + EPA, which is the Omega fatty acids we are most concerned with. It is the amount of DHA + EPA that is important. The general rule of thumb for raw fed dogs in 10 mg EPA + DHA per pound for maintenance dosing, and 30 mg EPA + DHA for therapeutic dosing. This is to balance out the Omega 6 to Omega 3 fatty acid ratio, and to provide anti-inflammatory benefits, along with cardiovascular, joint, skin and coat health benefits. 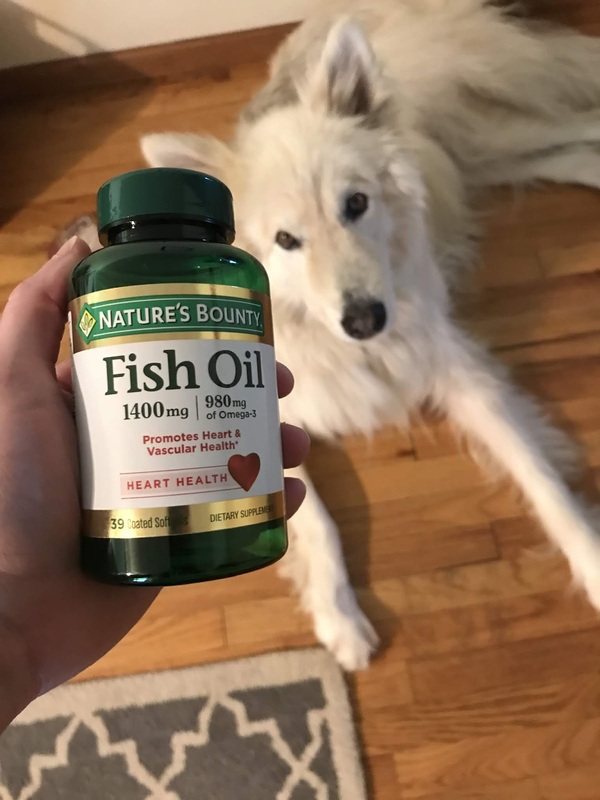 Neeko is currently on 60 mg per pound of DHA + EPA for her fish oil dosing. This is nearly 6000 mg for her. The most convenient and cost effective way for me to dose her is with Nature's Bounty concentrated fish oil capsules. Each capsule contains 1400 mg fish oil and 980 mg EPA + DHA. So she receives 6 capsules per day. She takes them easily, because she has figured out that if she punctures them with her teeth, she gets the fish oil taste. So they are treats to her. Glucosamine - Neeko is currently on two different joint/glucosamine supplements. I had her on GlycoFlex 3 chews, because they are in treat form, contain a high amount of glucosamine, and contain MSM and green-lipped mussel. (I love my dog so damn much I give her products that could kill me. I have an anaphylactic allergy to shellfish.) Dr. Baker suggested the addition of Arthroplex because it adds bromelain and boswellia. It also adds Vitamin C, which anecdotal literature suggests helps with joint pain and DLPA (DL-Phenylanine.) She is currently receiving 2 GlycoFlex soft chews and 4 Arthroplex caps per day. I am also offering her raw chicken feet and dehydrated venison trachea as treats. Both are natural sources of glucosamine and chondroitin, and very raw friendly. Last week Dr. Baker also sent us home with a bottle of DLPA (DL-Phenylalanine). It is an amino acid which can help canines with joint pain. We stopped the carprofen, which immediately improved her appetite, so she wanted this as a backup for pain, along with tramadol. Fortunately we haven't needed either one. CBD Oil - I have been giving Neeko CBD oil from a few sources for the last several weeks, including Canna Pet, Good CBD, and Pet Releaf, and Bark Avenue, a pet CBD bakery in Denver. I have found that 4-8 mg 2 or 3 times per day seems to do the trick for her. Finding good literature regarding CBD dosing for dogs is difficult. When I mentioned stopping the CBD to our vet, she insisted I continue. There is not much research out there regarding it's benefits or dosing, particularly in canines, but she has seen it with her own eyes. I next plan to try KOI CBD spray, after speaking about it at length with someone today. Turmeric - I am giving her some form of turmeric at least daily, preferably 2-3x daily. It has anti-inflammatory properties, along with a host of other benefits. Sometimes I give her a frozen liver-turmeric treat, recipe HERE. Other times I offer her golden paste, which I also eat myself because it tastes good. And at times I give her a frozen bone broth/golden paste treat. That is our current joint care regimen. She seems to be improving. The weather was glorious today, temps in the 70's with low humidity. She played outside with the boys for awhile, then she and I took a 25 minute walk this evening, our longest in several weeks. We are going to be continuing this regimen for the time being. Do you have any joint care products you would recommend? 3 weeks ago tomorrow, my dog was given a diagnosis of cancer. A week ago yesterday, I learned that she doesn't have cancer. Which is wonderful! But we still don't know what's going on with her. I will try to give a condensed version of where we are right now, and how we got here. In the previous update, I shared about our trip to the emergency vet, and plans for further diagnostics. I described how I dropped her off at the vet a week and a half ago, and they did chest xrays, which showed something abnormal, and a fine needle aspiration of her bone. On Saturday, 4 days later, I was at Costco at 2:30 in the afternoon when my amazing vet called me. "It's NOT cancer." I started crying in the middle of Costco. This is not what I was expecting to hear. I was overwhelmed, elated, and confused, all at the same time. Her cytology report had come back that day, no cancer, no bacteria. We discussed next steps. She was leaving a 21 day supply of antibiotics outside the office for me to pick up that afternoon. The next diagnostic - a urine test for blastomycosis. I dropped off her urine specimen, which was "interesting" to try and collect, at the vet's office first thing Monday morning. Then I waited. All week. I was hoping it would come back positive. Because then we would have an explanation. For both the spots in her lungs, and the bone issue. On Friday, an RVT called me to tell me it was negative. I was shocked. And I know it sounds weird, but I was also slightly disappointed. What's next? I don't know. I imagine I will speak with the vet office at some point this next week. Because Neeko is not ok. She's depressed, lethargic. Her appetite isn't very good the majority of the time. Tonight, for the first time in 3 weeks, I allowed her off leash. I think she enjoyed it. She is not limping nearly as bad as she was, which is what prompted me to take her to the emergency vet 3 weeks ago. That is very much a positive. I know being separated from the boys is likely impacting her affect, her mood. Both the antibiotic and anti-inflammatory she is on could be upsetting her stomach. She has had diarrhea for the last 2.5 days. This dog, who hasn't had an accident in the house in over 7 years, had an accident yesterday. I'm not even mad about it. Her stools are actually fairly formed today, but she has had 4 BM's, when she typically has 1, or rarely 2, per day. She's on an antibiotic, an anti-inflammatory, and I've been giving her CBD consistently for the last 2 weeks. I've had it on hand for several months, but began actually giving it scheduled a couple of weeks ago. I'm also shoving some form of turmeric down her throat a couple of times a day. She is still on her adequan. I don't know what do. I don't know what's next. I don't know what is going on, but I am so relieved that it is not cancer. I decided to try my hand at golden paste. But I wanted a golden paste that tastes good. I know of the benefits of it, for both humans and canines. I have been giving the dogs (particularly Neeko) turmeric with a fat carrier for a long time. But turmeric is better absorbed with the addition of black pepper. I myself could never stomach turmeric alone, only as an ingredient in various recipes, such as our Bone Broth. I did some research, and learned that the amount of black pepper included in a standard recipe recently increased from 2 tbsp to 3 tbsp, so that is one difference in our recipe. They other difference is the one that makes it much more palatable for humans and canines alike is raw honey! Though its a sugar, and contains carbs, honey has a variety of benefits. It is a natural antimicrobial and antifungal. It can help with environmental allergies. It contains phytonutrients and antioxidants. This is easy to make, requires easily obtainable ingredients, and stores in the refrigerator for 2 weeks, if it lasts that long. I eat a bit plain morning and evening. One could add it to smoothies or yogurt. For the dogs, I simply spoon a small amount, about 1-1.5 teaspoons, over their food, morning and night. 1/2 cup turmeric powder. Turmeric is more cost effective if purchased in the supplement aisle as opposed to the spice aisle. 1/3 cup organic virgin coconut oil. I started by grinding 3 tbsp of black peppercorns in a personal blender/magic bullet. A coffee grinder works well too. You can also use an old fashioned pepper mill, but that is time consuming and will likely leave you with sore hands, wrists, and forearms. Ignore my nails and cuticles. Mix together the water and turmeric in a small saucepan. Cook over medium to medium-high heat for 7-10 minutes, stirring frequently. A thick paste should form. Remove from heat. While still warm, stir in coconut oil, freshly ground pepper, and HONEY. Stir until thoroughly combined. Pour into a glass jar, store in refrigerator for up to 2 weeks, and enjoy! This recipe fits perfectly into a 16 oz Mason jar. 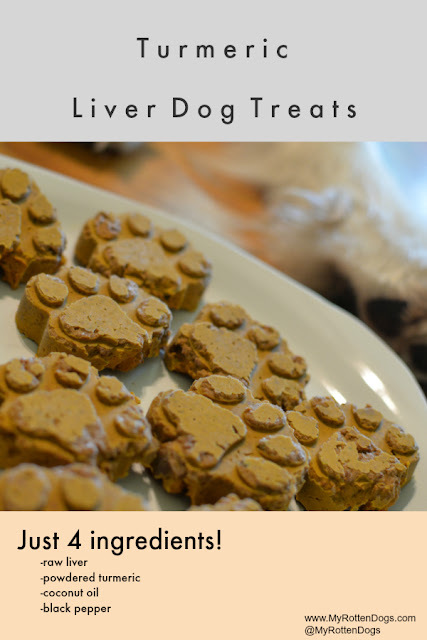 If you're looking for an alternative to golden paste in treat form, read about our liver turmeric treats. Are you looking for an alternative to golden paste for your dog? When Neeko became hesitant to eat her golden paste, I brainstormed and came up with a solution that works for us. Her golden paste didn't go to waste, I ate it without hesitating. 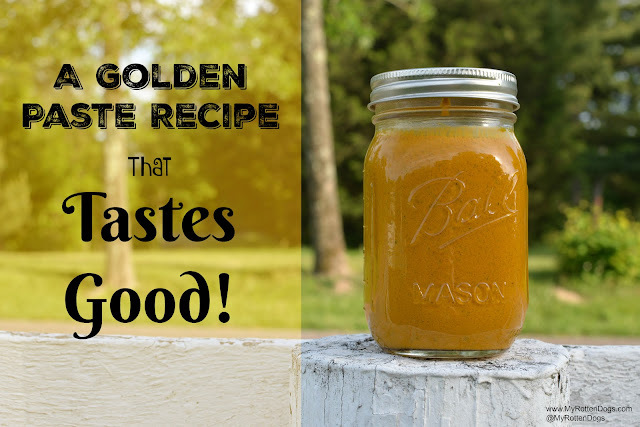 I'll be sharing *our* recipe for a golden paste that actually tastes good later. I won't go into the details about how good turmeric is for you, that is very well known, and it is easy to find plenty of documented evidence and studies showing it's benefits. I have written about and have been giving my dogs (particularly the princess) turmeric for a long time now, with various delivery methods. At first I gave it alone, then learned it is better absorbed with a fat. So I would mix it with salmon or coconut oil. I then made a golden paste that actually tastes good (to me, anyways.) Neeko, with her recent struggles, began refusing and eating around the golden paste, so I wanted to come up with an alternative. Neeko has texture issues, so I decided a frozen treat was in order, as she typically eats stuff frozen that she won't eat thawed - like fish, organs, etc. I came up with what might be the most disgusting thing I've made to date. Raw liver turmeric treats. I used all the same beneficial ingredients of golden paste, and combined them in a form that my dogs love, with the added bonus of raw liver. 1 lb raw liver. I used lamb liver from My Pet Carnivore, but pork, beef, or other liver would work. 1/2 cup organic turmeric powder. It's more cost effective to buy turmeric powder in the supplement aisle, as opposed to the spice aisle. 1/3 cup organic, virgin coconut oil. I started by cutting the lamb liver into somewhat uniformly sized chunks, 1-2 inches in either direction. It's a pretty disgusting task, so I highly recommend these poultry shears I recently raved about on Facebook. Toss them into a food processor. I'm a huge fan of my (older model) KitchenAid mini processor. Add in the coconut oil, turmeric, and whole peppercorns. The processor action will grind the peppercorns. Pulse until well combined and of a smooth consistency. You may have to use a rubber scraper to scrape the sides a time or two. (There's a funny story about me offering the scraper to Bruce to lick. I didn't think that one through. He jerked it away from me and took off with it.) WARNING - turmeric stains. It stained the plastic housing of my processor blade. It still works fine, is just now a lovely yellow shade instead of white. Divide mixture evenly into a freezer-safe silicone mold/tray. These are the molds I have. It helps to place the mold on a baking sheet BEFORE attempting to add the product. Depending on the size of your molds, the treats may need to split the treats in half or quarters after freezing. My molds gave us 16 treats (with a small amount of leftover slurry) using the ingredients above. They are not necessarily the prettiest treats. almost 1/2 tsp black pepper. The dogs all eat them willingly, which makes me happy. Do you offer your dogs turmeric?